This was our speech together with slides shown as a Power Point Presentation. “Hello everyone and thank you to Marc and APDAWG for hosting this important event and inviting us to speak on behalf of the greyhounds. My name is Trudy Baker – I’ve been a greyhound advocate for 17 years and founded Greyt Exploitations 10 years ago. I have also enjoyed the company of 8 rescued greyhounds over the last 18 years. Greyt Exploitations has always campaigned for dog racing to be outlawed because we believe even if all redundant greyhounds were found homes – the industry would still depend on inherent cruel practices for its profits – such as the destruction of dogs that fail to ‘make the grade’ and racing dogs on dangerously configured tracks. 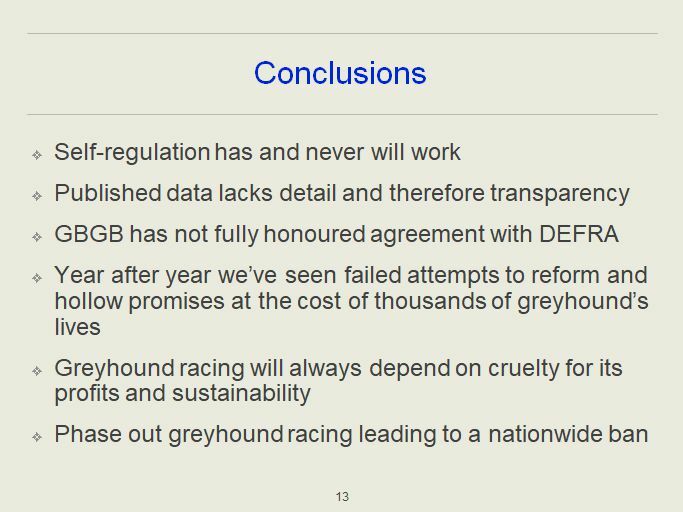 This evening we will question the GBGB data and remove the industry’s attempt to project greyhounds as faceless inanimate objects in terms of statistics and percentages. The deaths of 1,013 greyhounds should not be represented as 13.68% but as 1,013 sentient creatures whose lives were so cruelly cut short. There have been many calls for the industry to publish injury data as far back as 2007 but on every occasion the industry has ignored the recommendations and consistently failed to be open and transparent. 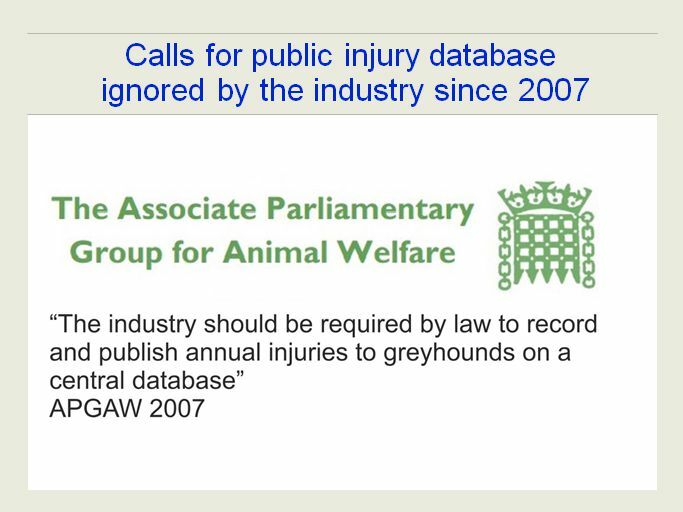 However statutory recording of injuries by individual tracks came into force with the passing of the 2010 Greyhound Welfare Regulations but despite the GBGB having to ensure the tracks were complying with this legislation and recording the injuries – the industry still failed to publish any injury data. 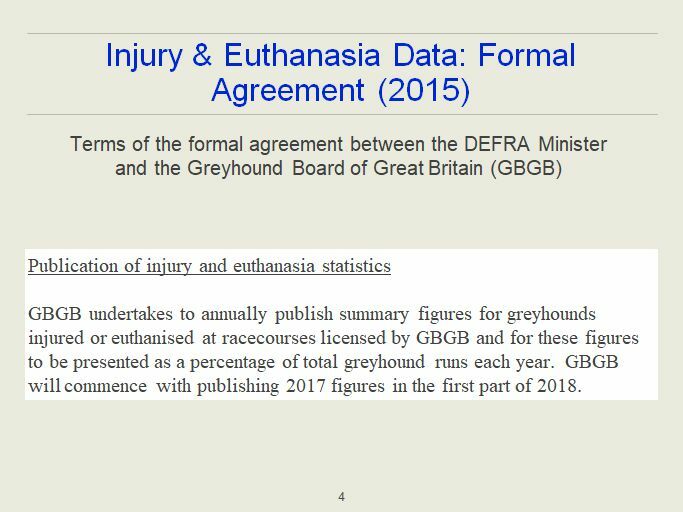 The Racecourse Promoters Association submitted trackside ‘euthanasia’ figures to the 2016 Efra Inquiry averaging an annual death rate of 431 greyhounds. 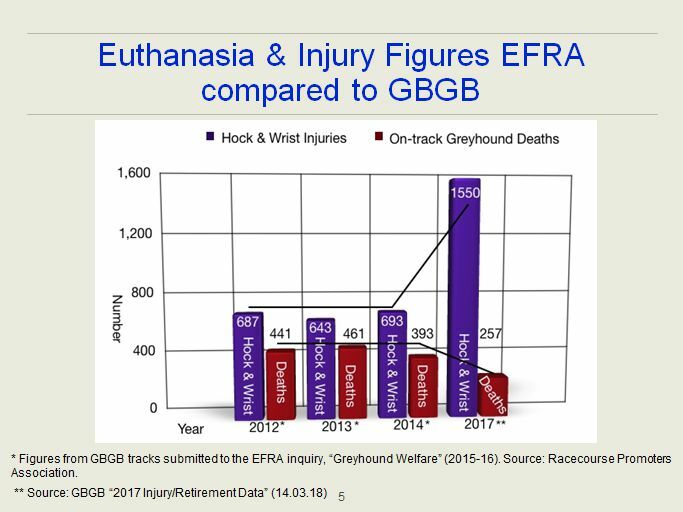 3 years later the GBGB’s data tells a very different story with a trackside death rate declining to 257 and despite the decline this figure represents 25 tracks – 3 more than data submitted to Efra. You have to question why has the track fatalities declined so rapidly while the rates for hock and wrist injuries has nearly doubled. It could be that in the face of having to publish death rates – the industry has taken steps to treat more injured greyhounds or it could simply mean that less dogs are destroyed trackside by a vet and more away from the track and by an unknown methods – which is concerning. 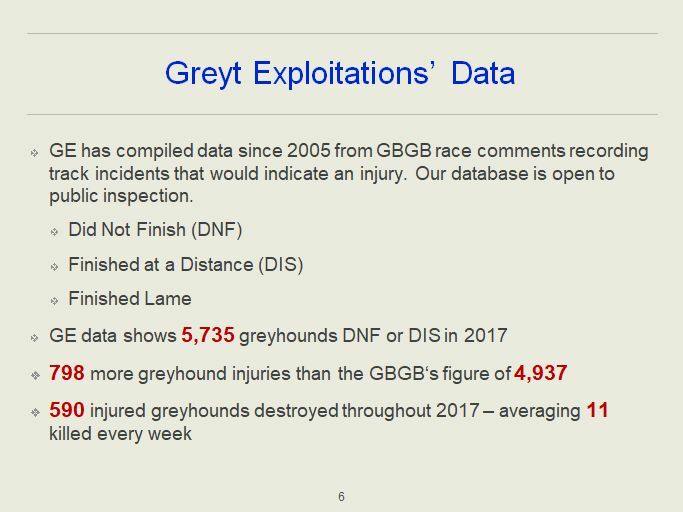 Greyt Exploitations data compiled from the industry’s race comments during 2017 shows that 5,735 dogs either did not finish or finished at a distance which would indicate the dog sustained some form of injury – 898 more than the GBGB has declared. Regardless – if the GBGB figures are to be believed – it is appalling that on average racing greyhounds sustain 13 injuries each and every day and more than 2 greyhound injuries will have occurred during this 2 hour meeting but more appallingly is that 590 – at least 11 greyhounds every week – were killed as a result of an injury. 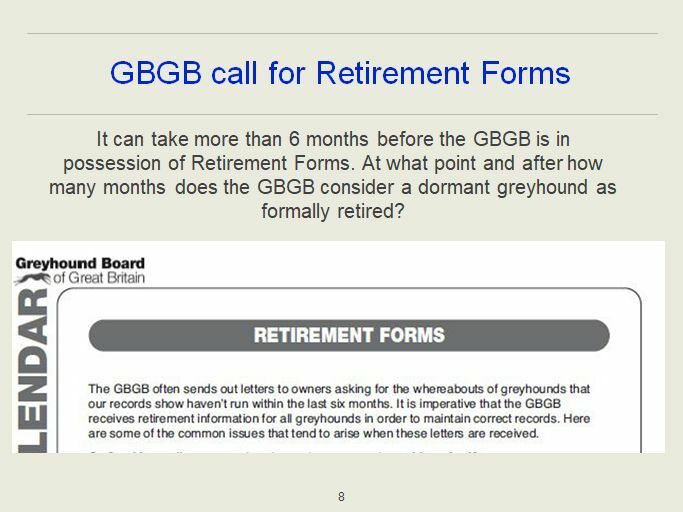 The figures for greyhounds that leave the industry are sourced from the GBGB’s green Retirement Forms. 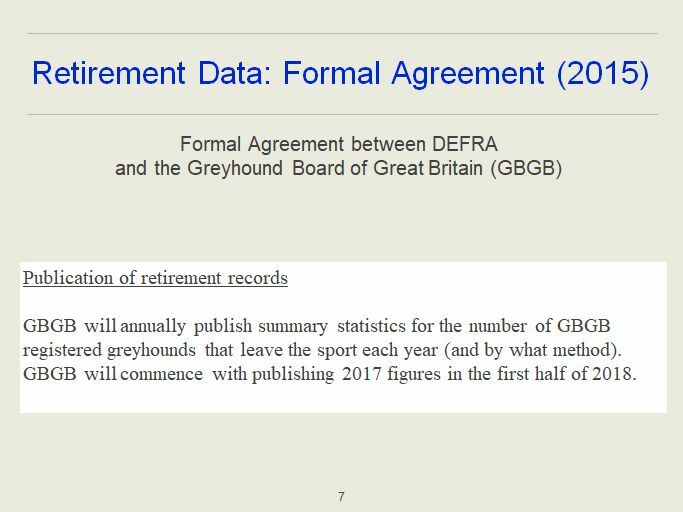 We believe that the premature publication of retirement data in March when the GBGB may not have received all the relevant Retirement forms for dogs racing in 2017 – renders the retirement data incomplete and the accuracy of the data questionable. And here we can see an industry publication calling for the return of Retirement Forms if according to the GBGB’s records a dog hasn’t raced for 6 months. Greyt Exploitations research shows that at least 7,706 registered greyhounds left the industry in 2017 – 302 more than the GBGB’s figure. 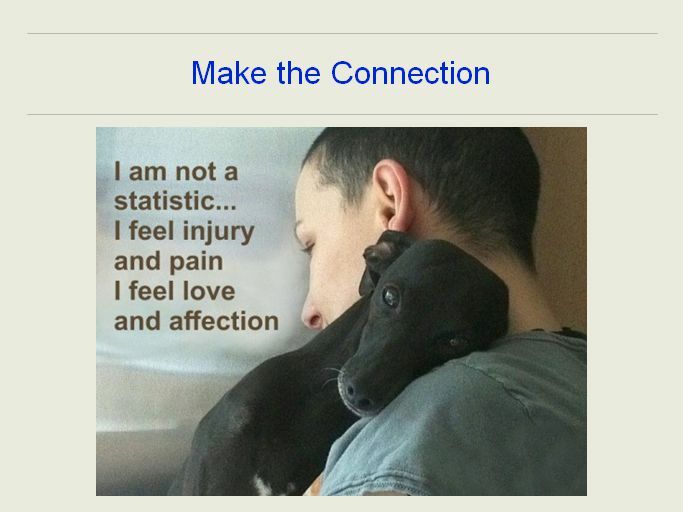 Where are these 302 greyhounds? Just as importantly – the formal agreement stated that GBGB should publish by what method greyhounds leave the sport. In Section C of the Retirement form there are a number of options for trainers/owners to list how a greyhound has left the industry. Amongst those options are as a pet – for breeding – for Independent racing – for racing abroad and lastly for other uses – which would include for research and or dissection. 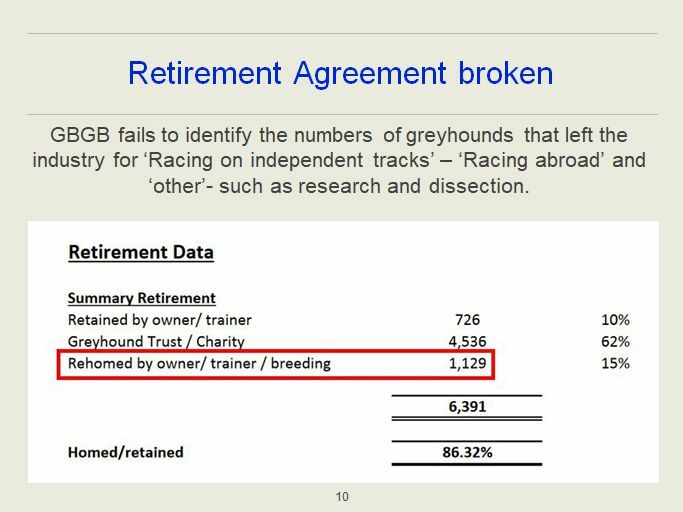 Cleary the GBGB’s published data does not list any greyhounds that have left the industry by these methods and we would question where is this data and again whether the GBGB has broken the formal agreement? Tia Rescue – an independent greyhound rescue inform us that they have on average taken in 89 ex GBGB racing greyhounds from independent tracks annually in recent years so clearly there is the potential for hundreds of greyhounds that leave the industry and go on to race on independent tracks. Why are these not listed? It is also appalling that the industry saw fit to destroy 270 greyhounds ‘designated unsuitable for homing’. Tia Rescue has recently opened a new kennel block dedicated to house up to 46 greyhounds that will need and receive extensive rehabilitation and or life-time specialist care due to the trauma and conditioning they sustained as a racing greyhound. If a rescue can make this provision – then why can’t a multi-million pound industry? 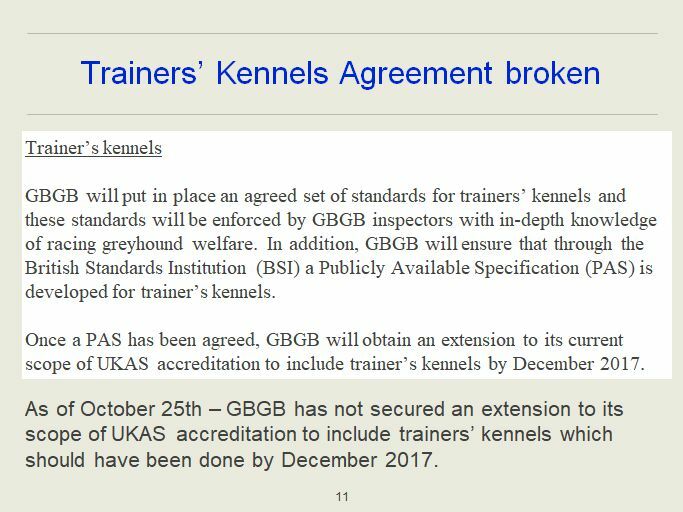 GBGB agreed to develop a Publicly Available Specification (PAS) in conjunction with the BSI and to obtain UKAS accreditation of trainer’s kennels by December 2017. Although the PAS – with its very basic minimal standards – came into effect in December 2017 – UKAS has confirmed there has been no extension to the scope of accreditation to include trainer’s kennels. This is yet another failure by the GBGB to comply with the non-regulatory agreement. 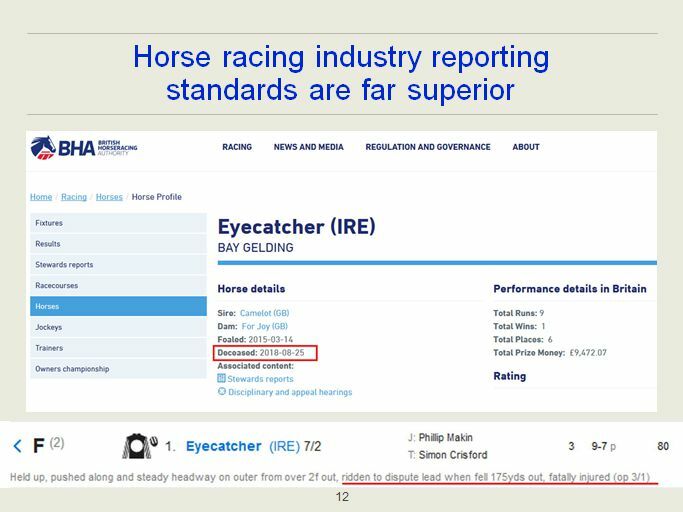 By complete contrast the horseracing industry’s reporting standards are far superior as they not only publish a fatality the same day via the Racing Post but the British Horseracing Authority lists all horses that are deceased on a central publicly available database. According to the Greyhound Star – Ireland exported 11,034 greyhounds in 2017 predominantly to the UK and there were 1,497 British bred greyhounds – making a total of 12,531 dogs yet in the same year only 8,094 were registered to race on GBGB tracks. 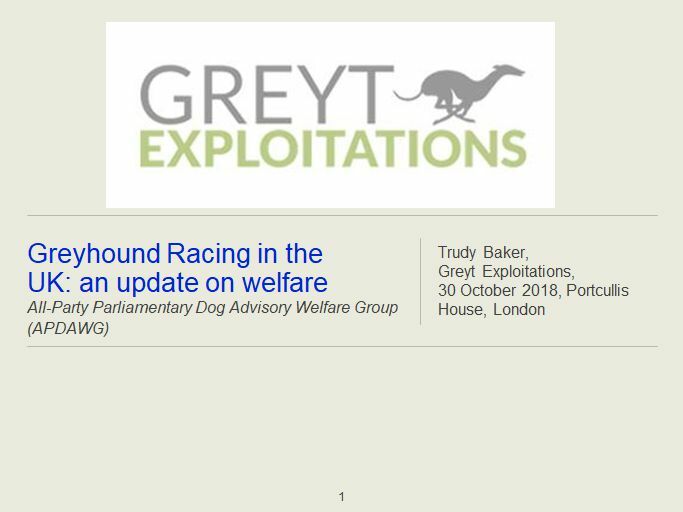 Which suggests there are still many thousands of greyhounds unaccounted for – where are these 4,437 greyhounds? So it would appear that a full audit of all the tracks has not been undertaken. 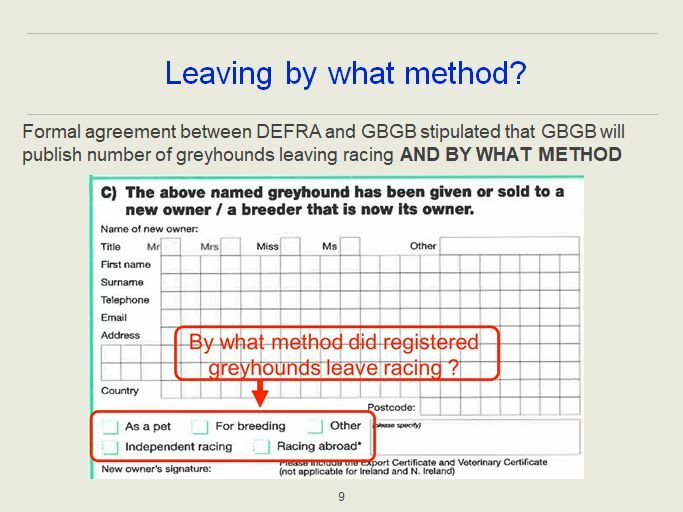 The only way to ensure accuracy is for the GBGB to generate a centralised database to record what happens to every greyhound bred for British racing once they are deemed no longer useful as a betting product and make that database available for public inspection. If the GBGB are as committed to welfare as they claim – they should not fear public inspection and immediately implement Rules of Racing For all trainer’s vehicles to be fitted with air conditioning – to cease racing where environmental temperatures reach 30°c – as recommended by The Society of Greyhound Veterinarians earlier this year and to cease racing when there are public firework displays. Greyhound racing will always depend on cruelty for its profits. It’s time to phase it out and bring in a nationwide ban rather than throw money at ‘window dressing’ welfare projects that only serve to mask the suffering and deaths of thousands of dogs in kennels and on the tracks. 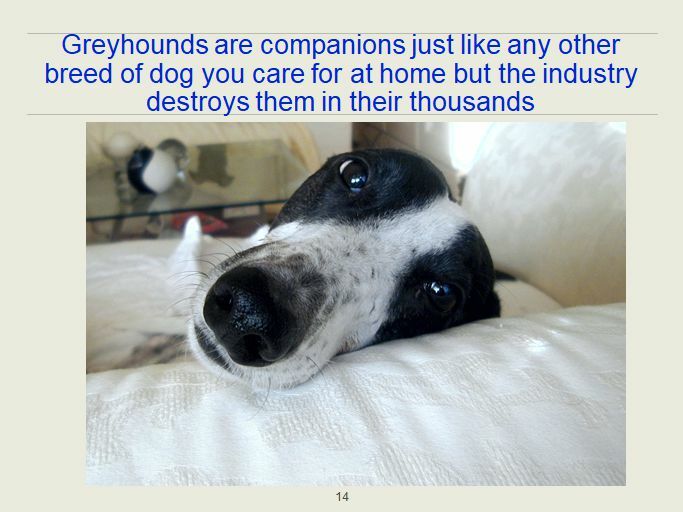 Greyhounds are companions just like any other breed of dog you care for in your home but the industry destroys them in their thousands.